Bob Johnson, Lusk, WY purchased several ZumBrunnen and Hytrek bulls. 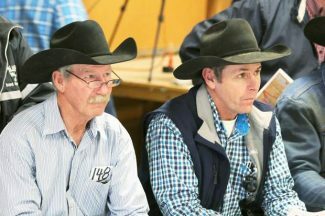 Jake Reed, Lance Creek, Kenny DeGering, Lusk, and Eric Wasserburger, Lusk, all purchased bulls at the ZumBrunnen and Hytrek Production Sale. 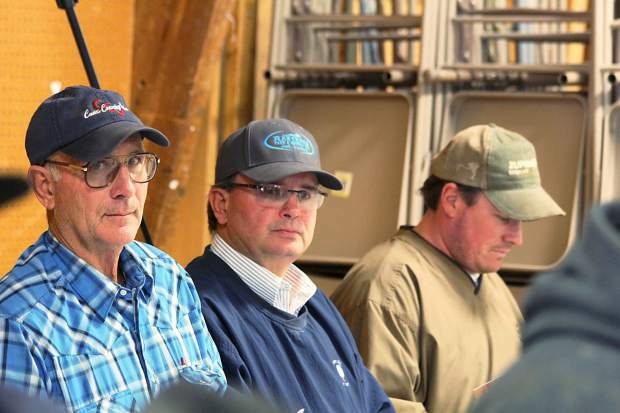 ZumBrunnen Angus, Lusk, Wyoming, and Hytrek Cattle Co., Cheyenne, Wyoming teamed up to host their second annual production sale at the Niobrara County Fairgrounds, Lusk, WY on Mar. 21, 2016. The bulls had been very carefully selected for the sale and only the best were offered. The bulls are structurally correct, performance evaluated and grown out to stay sound in the breeding pastures. The ZumBrunnen and Hytrek operations compliment each other very well in the philosophy of breeding sound cattle and not chasing fads or the bull of the day. Both pay attention to the economic and practical traits of fertility, docility, calving ease, growth and milk. The large crowd on hand were pleased with the sale offering and gave the ZumBrunnen and Hytrek outfits a great sale. Topping the sale was lot 6, HCC Simulator 5030, a Feb. 2015 son of HF Simulator 62Z with epds of CED 4 BW 1.6 WW 57 YW 111 Milk 24 that sold to Jake Reed, Lance Creek, WY for $10,000. Lot 18, HCC Cash 5070, a Mar. 2015 son of Barstow Cash with epds of CED 4 BW 3.3 WW 56 YW 110 Milk 20 sold to Joe Netz, Lost Springs, WY at $10,000. Lot 5, HCC Cash 5022, a Feb. 2015 son of Barstow Cash sold to Jim Dunn, Harrison, Nebraska at $9,000. This bull has epds of CED 9 BW 0.5 WW 59 YW 113 Milk 21. Lot 17, ZA Combination G5019, a Mar. 2015 son of Connealy Combination 0188 with epds of CED 12 BW -1.6 WW 48 YW 87 Milk 20 sold to Todd Semrosky, Harrison, Nebraska at $8,000. Also selling for $8,000 was lot 52, ZA Hoover Dam G5137, a Mar. 2015 son of ZA Hoover Dam G1001 with epds of CED 11 BW 0.6 WW 54 YW 94 Milk 21. 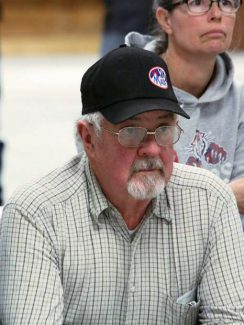 Jim Dunn, Harrison, Nebraska was the buyer. Lot 27, ZA Comrade G5049, a Mar. 2015 son of Connealy Comrade 1385 sold to Dwayne Horton, Otto, WY for $7,000. This bull posted epds of CED 11 BW -1.1 WW 37 YW 74 Milk 16.